George Scott was 18 years old on the morning when his life changed forever. He was venturing from home, for the first time, and riding on a Nashville-bound train. Planning to support the war effort—by making powder at the DuPont plant located in Old Hickory, Tennessee—George had an unsettled feeling. Riding the No.1 Express Passenger Train from Memphis, he kept waking up through the night. George had a feeling that something bad was going to happen. Around 6 o’clock—on the morning of July 9, 1918—George left his seat. He walked to the passenger car behind his—also made of wood, not steel—and sat down. Then, for no apparent reason, he pulled the shade and, as he later said, waited. The local Nashville, Chattanooga & St. Louis train ( No. 4) was preparing for its trip. Passengers boarding the train, at Union Station, took their seats. A young bookkeeper spotted Willis M. Farris, a respected Nashville businessman, and offered his seat to the older man who gladly accepted it. It would be one of the last things Farris ever did. David Kennedy, the engineer aboard the No. 4 train, guided his westbound train out of the Nashville station at 7:07 AM. He was seven minutes late. William Floyd, making his last trip before retiring the next day, guided his eastbound train along the track toward Nashville. He was running thirty-five minutes late. No. 1 had the right of way when the tracks changed from double to single. 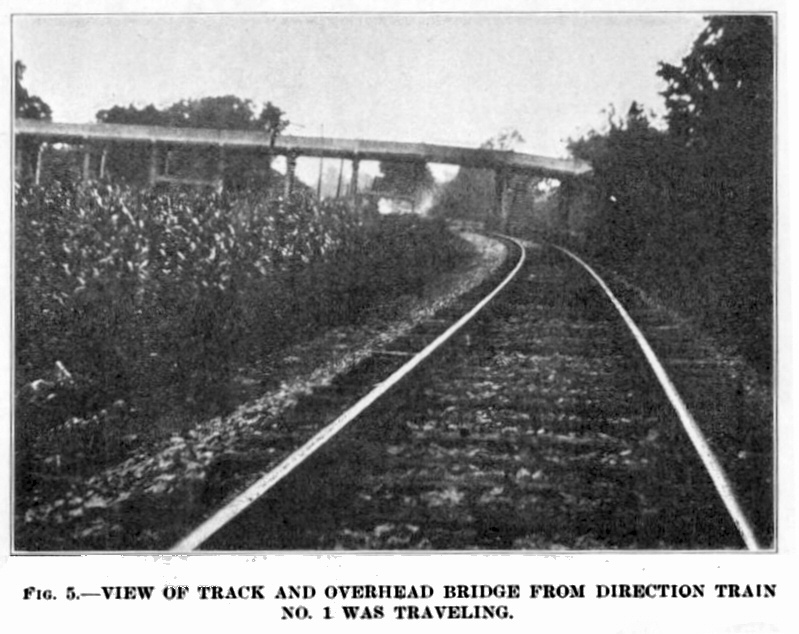 West of the Nashville station, a single-track stretched for about ten miles. If the men aboard No. 4 did not see No. 1 pass them—while they were still on the double track—they would have to stop. Conductor Eubank, aboard No. 4, was collecting passenger tickets when another train rolled by. Without confirming, he assumed it was No. 1, since it was due to arrive at Union Station around 7:10 am. The passing train was not No. 1. At the fork in the track, where a double rail gives way to a single rail, J.S. Johnson was at his post in the tower. From the top of the tall wooden structure, Johnson displayed a green sign for Train No. 4. It was a signal letting the engineer know that he had a clear path ahead on the single track. Then, utterly stunned, he froze. He had just given the No. 4 train a “clear” signal,” but his record book revealed that the No. 1 train had not-yet passed by the tower. He [No. 4] meets No. 1 there, can you stop him? Although he blew the emergency whistle, and changed the green sign to red, Johnson did not see anyone standing at the rear of No. 4. No trainman had heard the warning sound. Kennedy continued his westbound course along the now-single track. Dutchman’s Curve—a blind spot along the single track near White Bridge Road in the Belle Meade section of Nashville—was directly ahead of both trains. Each train was traveling between 50-60 miles per hour. He told me that he was riding in the engine like he normally did. But he went to the rear of the train. Something just told him to go back there. Soon thereafter the engineers, on both trains, saw the unimaginable. 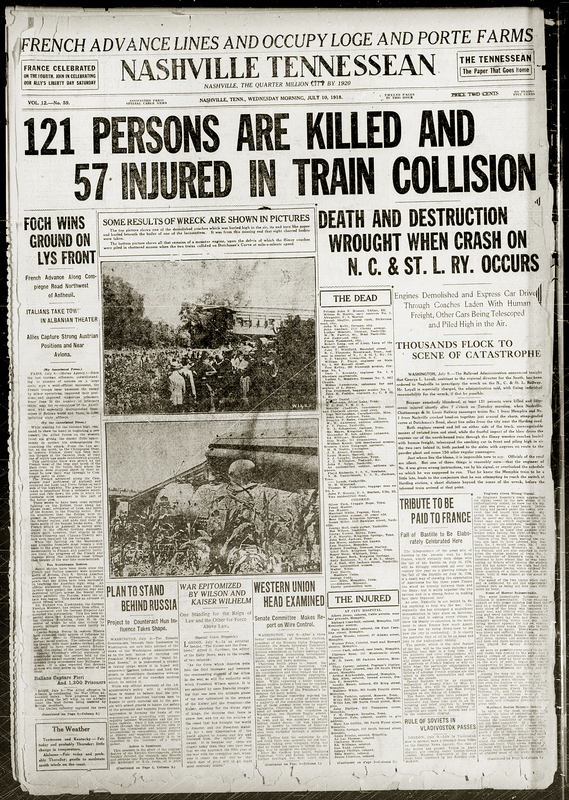 America’s deadliest train disaster was about to occur at the sharp and steeply graded curve. Forcefully pulling No. 4's brake lever, Kennedy tried to avoid a head-on collision. There was nothing he could do as two 80-ton engines crashed into each other. People could hear the sound of the disaster two miles away. The force of the impact, as one train telescoped into the other, sent wooden passenger cars flying through the air. Although their experience was traumatic, fortunate survivors were thrown clear of the wreckage. I had to raise up the window and the glass was falling all over everywhere...and finally I got out of there. And I wandered out past a cornfield, best I can remember, and I run across one of the trainmen laying there. Every time he was breathing, blood run out of his mouth. It done knocked me down...You couldn't tell one part of the bodies from another. They were just all cut to pieces. After he’d moved from his original seat to a different passenger car, Scott sat near a young mother and her child. Neither survived the crash. For three days, the young man was in shock as he walked around Nashville in his blood-stained clothes. He soon returned to Memphis. Local journalists sound nearly breathless as they reported events associated with the crash. 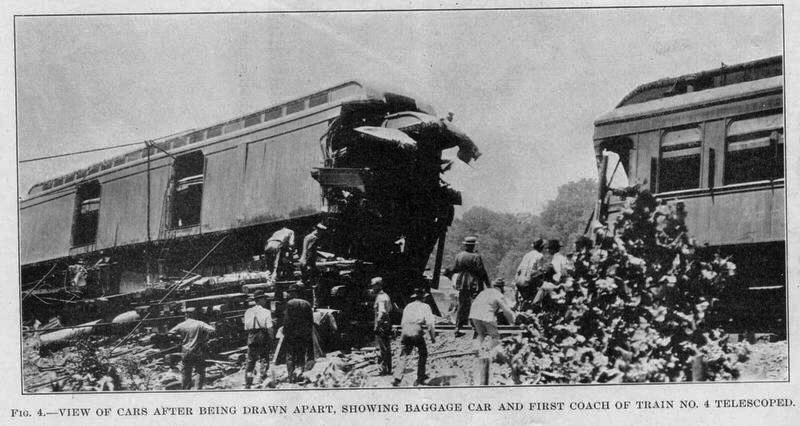 ...Both engines reared and fell on either side of the track, unrecognizable masses of twisted iron and steel, while the fearful impact of the blow drove the express car of the north-bound train through the flimsy wooden coaches loaded with human freight, telescoped the smoking car in front and piling high in air the two cars behind it, both packed to the aisles with Negroes en route to the powder plant and some 150 other regular passengers. Just where lies the blame, it is impossible now to say. Officials of the road are silent. But one of three things is reasonably sure - that the engineer of No. 4 was given wrong instructions, ran by his signal, or overlooked, the schedule on which he was supposed to run. 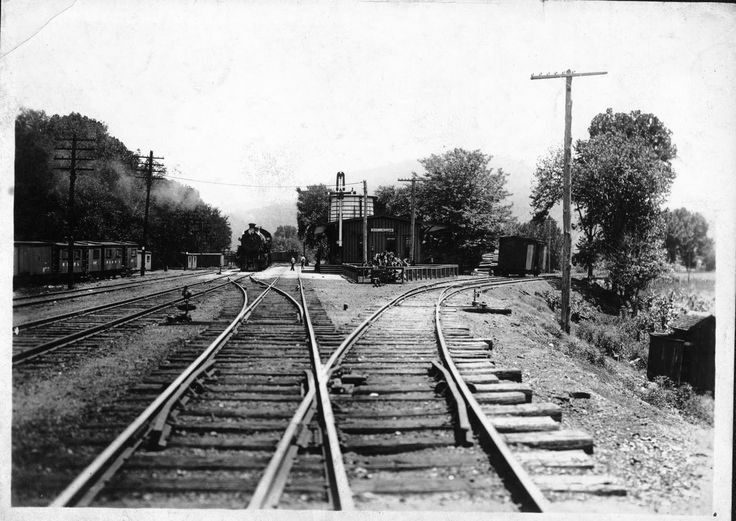 That he knew the Memphis train to be a little late, leads to the conjecture that he was attempting to reach the switch at Harding station, a short distance beyond the scene of the wreck, before the inbound train arrived at that point. They were ready to embalm him. Then he moved. Instead of being cared-for at the morgue, Corbitt went to the hospital where doctors thought he would lose his leg. He didn’t and, decades later, he survived another train wreck, in 1951, when he was able to jump from the train. The story, of America’s deadliest train wreck, quickly fell out of the news. Perhaps that is because the country was still at war. Perhaps, however, there was another reason. During the ensuing years, train wrecks have continued in America and in other countries. Sometimes the wrecks occur because trains “jump” the tracks or become derailed. Sometimes—as in the case of the Great Circus Train Wreck which happened just weeks before the Dutchman’s Curve disaster—they occur due to human error. The deadliest train wreck of all happened, in Sri Lanka, because of the 2004 tsunami. In 2015, a train traveling around 100 mph as it approached a tight turn not far from Philadelphia’s 30th Street station, resulted in at least eight deaths and at least 200 injuries. During World War II, in nearly the same place, another disastrous train wreck occurred, killing nearly 80 people in 1943. Fortunately—despite the disasters which have occurred on America’s train tracks—traveling by rail remains a safe method of transportation in the States, just like it does in other parts of the world. Image of the 1918 Dutchman's Curve trainwreck, online via Tennessee State Library and Archives. Bos, Carole "America's Deadliest Train Wreck" AwesomeStories.com. May 16, 2015. Apr 25, 2019.